Clark and his mother walk across the field, discussing their project. Clark thanks her again for doing this. He couldn't exactly take this project to a tailor. Clark shows Martha a sketch of what he wants the costume to look like. In the background, Jonathan looks on sullenly. He turns and heads upstairs to Clark's room. He looks at the marks on the wall indicating Clark's growth, and the dent in the ceiling that Clark caused when he was four. He heads back downstairs. Entering the kitchen, Jon asks Clark for help around the farm. Clark tells him that he will be with him in a minute, and then goes back to helping his mother design the suit. To show her what he has in mind, Clark turns the tablet on. Images of Clark's ancestors appear on the screen, emblazoned with the S symbol; generations of explorers and champions of his lost race. Clark suddenly tears himself away from the tablet and warily looks outside. While he was busy Pa got everything fixed up without him. When his father comes back inside Clark tries to apologize, but Pa just brushes him off and tells him soon enough he can just go around play-acting in his costume. Clark exchanges a worried glance with his mother. That night Martha talks to her husband and asks him what Clark did to upset him. Martha tells him that while Clark is changing so much he needs them to remind him he's still like them. Jonathan says that's the point, Clark isn't like them. Martha is shocked that Jon would say something like that, especially if Clark happened to hear it. Outside in the dark fields, Clark sits alone. Clark and Martha talk out in the barn, Clark examining the spacecraft with his microscopic vision and Martha sewing the costume. Clark asks his mother what is wrong with Pa, but Martha just tells him she doesn't know. Pa comes into the barn and while Clark tries to talk to him, Jonathan just brushes everything off. Jonathan grabs a sledgehammer to go and do some work as Clark and Martha head into the house. Left alone, Jonathan wraps his hands around the sledge and grimaces. Then, suddenly, he lashes out and begins to hammer on the spacecraft. He rains blow after blow down on the alien craft, not doing any damage. However, the ship slams up against a beam, which splinters more and more with every blow. Suddenly a final blow breaks the pillar in two and the roof begins to come down on top of him. Jonathan panics as the barn falls down on top of him, but Clark soars in at the last moment and pulls his father to safety. Hovering above the fields, Clark asks his father what that was about. Pa tells him to put him down, but Clark says not until he tells him what the problem is. Jonathan tells Clark that he tried to do a father's job, but he failed. They should have had a bond, but if their bond was that strong then seven years apart wouldn't have broken. Jonathan says that now Clark doesn't even want to keep his own name anymore. Leading him inside, Clark tells his father that he got the courage to leave home and travel the world from his father. And he wants a dual-identity to protect everyone, but he doesn't want to stop being Clark Kent. Martha asks why he doesn't want a mask then, but Clark tells her if people are going to trust him then they need to be able to see his face. Martha tells him that if this is going to work then he will need some form of disguise. She tells her son that he can't wear t-shirts anymore because they show off his muscles too much. She gives him a sweater. She then asks to hear his voice, and when he recites something she tells him that he needs to speak a little higher and softer. They put a jacket on him and have him slump a little. His parents look at him and tell him that he still needs something more. His eyes are too blue, so Martha takes Jonathan's glasses and puts them on her son. Using his x-ray vision to look through the lenses Clark has no problem with them, and the glasses disguise the color of his eyes some. Clark looks in the mirror to see the new him. He's incredulous that glasses will work, but Martha assures him that it will work. Later, Clark packs his suitcase and prepares to leave. His parents ask if it's wise to surround himself with reporters, but Clark tells them that he's a journalist and he needs to be able to do that too. Plus, he will hear about problems faster that way. Hugging goodbye at the train station, Ma and Pa ask Clark which big city he's going to head for. Clark asks them where else is there, as he holds up a ticket for Metropolis. Story - 4: I think that this issue is the first one where the series really hits where it should be (and next issue should be even more so). Waid just writes well. I enjoyed Martha and Clark designing the costume, and the scene of designing the new Clark Kent was very well done. I didn't like the conflict between Clark and his father though. It seemed kind of forced, and I also didn't like the idea of Clark's father being against the costume. I much prefer his father helping with the idea, taking inspiration from the Mystery Men of the 1940s. I also wish we had seen Clark in costume, but perhaps we'll see the big introduction next issue. Apart from that though, this was a very enjoyable issue that continued a solid series. Art - 4: And the art continues to be good as well. I'm not sure why I like it, but I feel that it fits the series very well. It's clean and simple, and has a nice personal feeling to it that lends itself very well to this kind of story. I'm not sure that I would like Yu on a monthly, but he shines in this sort of thing. A few panels detracted from the quality of the art, and Yu's Pa isn't the greatest (although that could be the coloring more than anything) but regardless, this was a very solid issue. Cover Art - 3: There really isn't anything horrible about the cover. I can't complain about having Superman on the cover because now at least we have a costume. However, this cover just didn't have much to do with the issue. 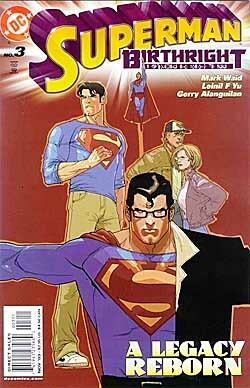 I can see links to it, with Clark half in costume and half out at the bottom and his parents standing there, but apart from that this cover just feels like a random collage. We have three pictures of Superman and a generic background. Not a bad cover, but it could have been better.